Crayola® Construction Paper Shapes are one of the easiest ways to start creating works of art, and with these precut shapes you can take scissors out of the equation! This set of 48 micro-perforated sheets of 9” x 12” construction paper comes in 6 assorted vibrant colors. Shapes are easy to punch out as needed and there is something to inspire any imagination. 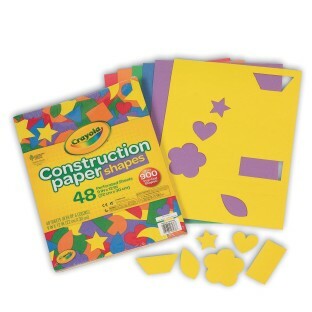 48 sheets, over 900 total shapes including simple shapes like stars, triangles, circles, hearts, half moons, and more.